Army Spc. 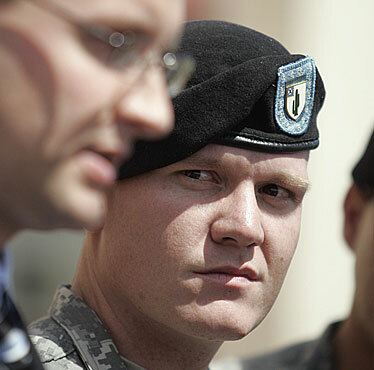 Christopher Shore, right, listened yesterday as his lawyer, Michael Waddington, spoke to the press at Wheeler Army Airfield. In the 1986 Academy Award-winning Vietnam War movie "Platoon," a Tropic Lightning 25th Infantry Division unit was led by a sergeant who ruled by intimidation and used deceit to cover up a war crime. That plot was used yesterday to illustrate the defense of a 25-year-old Schofield Barracks soldier accused of helping to kill an unarmed civilian whom the Army says was a terrorist responsible for making bombs in Iraq. Spc. Christopher Shore and Sgt. 1st Class Trey Corrales are charged with murder. A pretrial hearing at Wheeler Army Airfield was held for Shore yesterday, and one for Corrales will take place Monday. Shore's attorney used the plot of "Platoon" to describe how Corrales, not Shore, was to blame for the killing. After the hearings, officers will recommend whether the two soldiers will face a court-martial and possible death sentence. Army prosecutors said yesterday that a 25-year-old Schofield Barracks soldier should face a court-martial for shooting an unarmed Iraqi civilian in the face during a midnight raid in Iraq in June. However, Michael Waddington, Spc. Christopher Shore's civilian attorney, said all the charges against the 25th Infantry Division scout should be dismissed since it was his platoon leader -- Sgt. 1st Class Trey Corrales -- who was responsible for the killing. Those were the closing arguments made at Wheeler Army Airfield last night following a nine-hour pretrial hearing before Lt. Col. Raul Gonzalez, deputy commander of the 3rd Brigade Combat Team, who is serving as the investigating officer. During the next few weeks Gonzalez will review the testimony of 15 witnesses and the evidence presented yesterday and recommend to Maj. Gen. Benjamin Mixon, 25th Division commander, if Shore will be court-martialed. A similar Article 32 hearing, the military's version of a preliminary hearing, will be held for Corrales beginning at 9 a.m. Monday. The investigating officer in that pretrial hearing will be Lt. Col. Mark Germann. Monitoring Shore's pretrial hearing yesterday was Frank Spinner, Corrales' civilian defense attorney. Both Corrales and Shore are charged with premeditated murder, which carries a maximum sentence of the death penalty. The minimum mandatory sentence is life imprisonment. Shore maintains Corrales fired the two shots in the face, two in the arms and one in the stomach that killed the Iraqi, whom the soldiers believed was an insurgent bomb maker. In his opening statement Waddington compared the 3rd Brigade's scout platoon to one in the 1986 Academy Award anti-war movie "Platoon," in which the sergeant, portrayed by Tom Berenger, had little regard for the conventions of warfare and committed a war crime by killing a Vietnamese women while interrogating her husband. Waddington said there were no officers in charge of the scout platoon and that Corrales "ruled it with threats, fear and retaliation. He ruled it with an iron fist." The scout platoon of about 30 soldiers was described by Waddington as a close-knit unit that valued its elite status, and Corrales used his power and his special relationship with its battalion commander, Lt. Col. Michael Browder, to keep the soldiers under him in line since no one wanted the shame of being fired from the unit. Many of them crowded into the small Wheeler courtroom yesterday. Sgt. David Morgan-Benford testified that the platoon was "basically like a family. ... It's where you wanted to be." Corrales was known in the unit as "Browder's wrecking ball," Waddington said. Browder was relieved by Mixon of his command of the 2nd Battalion after the incident. Waddington, during a noon recess, said he is still trying to find out why Browder was fired from his job. He has not been charged in the shooting. During the hearing, witnesses said Corrales was anxious during the June 23 raid to avenge a death of a friend who had been killed by a homemade bomb on a road near a village in Kirkuk. Morgan-Benford said that before the start of the June 23 mission, Corrales ordered the soldiers "to kill all military-age males." There were other orders by Corrales to kill anyone found on the street during the raid. Corrales' platoon had flown in to clear houses believed to be harboring insurgents who had planted roadside bombs. Prosecutor Capt. Duane Kees put Sgt. 1st Class Dennis Bulham, whose job was to protect the unit's medic, on the stand to testify that when he first saw the wounded Iraqi, there was only blood from wounds in his chest and back. Later, Kees said, when he came back there were also wounds to the victim's face from shots that Kees said were fired by Shore. Shore, the only witness to the killing, testified that Corrales had threatened soldiers in his unit by sticking the barrel of a rifle down a soldier's throat until he gagged, or taking a knife and sticking it in a soldier's crotch. Shore said Corrales tried to plant a confiscated enemy AK-47 rifle on the victim and told him several times to run. Shore said the last time he saw the victim, the Iraqi civilian was walking backward away from him with his hands on the back of his head. According to Shore, after shooting the Iraqi, Corrales grabbed the front of Shore's vest and told him to "finish him off," Shore said. Instead, Shore said, he pointed his M-4 carbine away from the victim and shot two rounds into the dirt. He said that after the incident he joined five other soldiers who reported the shooting. "I had nothing to hide because I did the right thing," he said.